January 2019 Community Consulting Services Ltd. 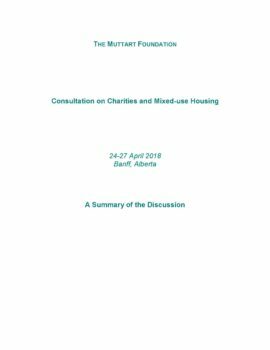 In spring 2018, the Muttart Foundation convened a meeting of sector representatives, government regulators, professional advisers and international experts to discuss the issue of Mixed-Use Housing. The session was one of an on-going series of meetings to foster an exchange of ideas and allow for a sharing of concerns of both sector groups and regulators. No undertakings or commitments from either regulators or sector participants are expected or made at these sessions, and any remarks in the report are meant only to reflect the discussions. A copy of the report is available here.